Yes, GM has confirmed that there will be a 2016 Chevy Suburban Heavy Duty. But it will only be available to commercial and government outfits buying them in bulk. It basically identifies that there will be a Class 3 (10,000 to 14,000 pound GVWR)-rated Suburban "HD" in 4x4 LS and LT trims. So no luxury LTZ variant (yet?). GM Authority said Chevrolet verified that hypothesis and I've confirmed it with GM myself, though all I could get out of them was; "HD Suburban will only be available for Commercial and Government Fleets. Additional product information will be shared as it becomes available." Interestingly there's no mention of the 6.0 V8 or 6.6 Duramax Diesel that powers the 2015 Chevrolet Silverado and GMC Sierra 2500 HD trucks, so perhaps this this uprated Suburban will be more of a half-measure between the half-ton base and three-quarter ton heavy duty trucks. If the new Suburban HD never makes it to mass market but you still really want one... at least you could wait until they get auctioned as surplus in a thirty years? Or maybe you'll be able to build your own if the frame's the same. 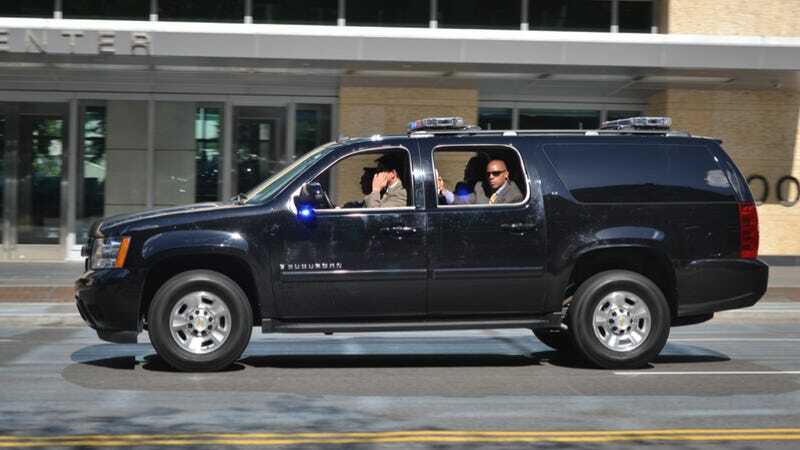 Secret Service Suburban image via Stefan/Flickr.